Building 3 7 Grosvenor Rd Croydon NSW 2132 for sale Land zoning Zone R1 FSR Range 3.00 3.49 Height of Building 25.0 to 29.9 M Perfectly positioned in the highly sought after residential suburb of Croydon NSW. Only a short stroll to Croydon train Stations, Croydon shops and amenities. This exceptional 3 levels building positioned with a very wide street frontage and easy under park car access. This is a truly significant opportunity for an astute investor, developer or builder. Description Currently 3 levels with 20 generous size two three bedroom apartments. Potential 70 plus apartments development site. Prominent location in Grosvenor St. Location 100 m to Croydon Railway Station. 120 m to Croydon Shopping Centre Cross the road from PLC private School. 800 to Burwood Westfield shopping center. 130 m to Croydon public school. Excellent long term investment bull; The property yearly rental income is $728,000 approximately. Great short term investment bull; Potential development site for 70 plus brand new apartments approximately. Sale by tender process, To obtain the public tender form and the memorandum of understanding/ for further information: Please contact Stephen Shamoes on 0450 519 116 or Dan Zhu 0432 120 021. John Shalala 0405 535 611. Sale by the tender process closed on 26th February 2018 unless sold prior. Da Approved Duplex Site In Premier Bayside Location For Sale - DA Approved Du..
Land Zoning Zone R1 FSR Range 3.00 3.49 Height Of Building 25.0 29.9 M SALE BY TENDER ANY OFFERS ARE TO BE LODGED ON OR BEFORE 5.00PM FRIDAY 31ST MARCH, 2017. Perfectly positioned in the highly sought after residential suburb of Croydon. Only a short stroll to Croydon train Stations, Croydon shops and amenities. 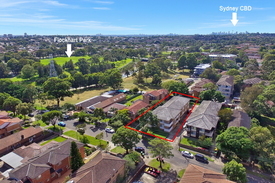 This exceptional site positioned with 2 street frontage and easy access .This is a truly significant opportunity for an astute investor, developer or builder. Description Potential 28 to 30 Units 2 bedrooms. Prominent 2 street frontage Young St, Grosvenor St 28 to 30 Residential units consisting 2 bedroom apartments 850.75 SM of land size. Location 150 m to Croydon Railway Station. 180 m to Croydon Shopping Centre Cross the road from PLC private School 800 to Burwood Westfield shopping center. 190 m to Croydon public school. To obtain the public tender form and memorandum of understanding and for further information: Please contact Stephen Shamoes on 0450 519 116 or John Shalala 0405 535 611 Sale by tender closed by 30th March unless sold prior. Development Sites For Sale - Residential Mixed Residential CONTACT AGENT DIRECT 0428..